What I Learned This Week – 9/14/14 | I'm not stalking you. The weather has turned cold this week in Michigan. As usual, we have gone straight from summer to winter. Mother Nature skipped all altogether. This had me thinking of Hawaii. I have never been, but have always wanted to. 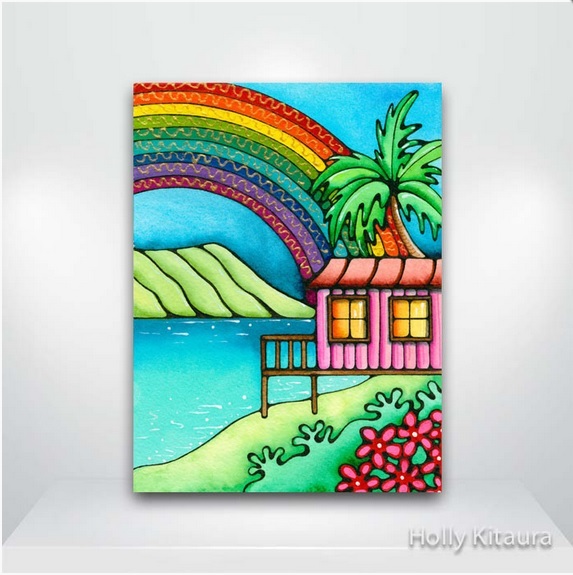 In an alternate universe somewhere, instead of meeting and dating my future husband, after college I moved to a little shack in Hawaii. I lived cheap and rode a bicycle. I didn’t even know if such shacks actually existed there. 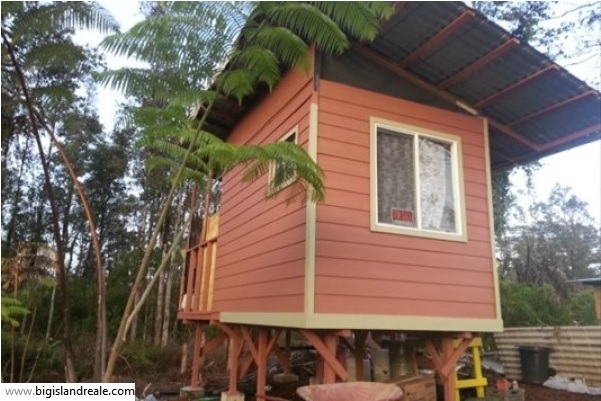 The other night, on a whim, I searched for Hawaii real estate. The first property I found was only $19,000. And pink! I know, very rustic. Definitely not suitable for a husband, wife, toddler, and a lab mix. But, when I was 22, I could have managed with it. On Saturday, my family set out to check out a cute little camper. We fell in love with it. While we daydreamed about having the means to tow it home, we garage-saled. We ended up at a local consignment store where we often find treasures. I found a box of old vintage photographs, marked at one dollar a piece. This made me very sad. All these images of people. These aren’t models paid to be in advertisements. These were real people, captured living their lives. 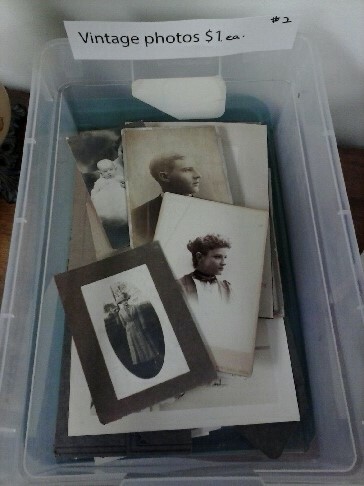 Pawing through the box, I could tell that sometimes there were several pictures of the same person, throughout their lives. How did they end up here? Did their families clean out a house when there was a death and they were just dumped here? Even if you didn’t know who they were, isn’t it someone’s duty to hold on to them? How can people just cast away their family members? Maybe i just have that mindset because I have so little family, and know so little about the rest. It instantly made me sad. I don’t want my picture cast aside in a box marked at a dollar for some stranger to snicker at when I am gone. I want my life to add up to more than that. I want to be remembered. I felt like I had to give at least one of these people in the vintage pictures a new home. I ended up bringing home two. The first picture I chose was a woman standing with a hat on outdoors. There is no identification of any kind on the picture. She has on glasses. If you look quickly, she is smiling. If you look closer, you realize that maybe she isn’t. At first I thought she was a teenager. But, the styles of the time make it difficult to tell. She could be in her 20’s, or a youthful 30. 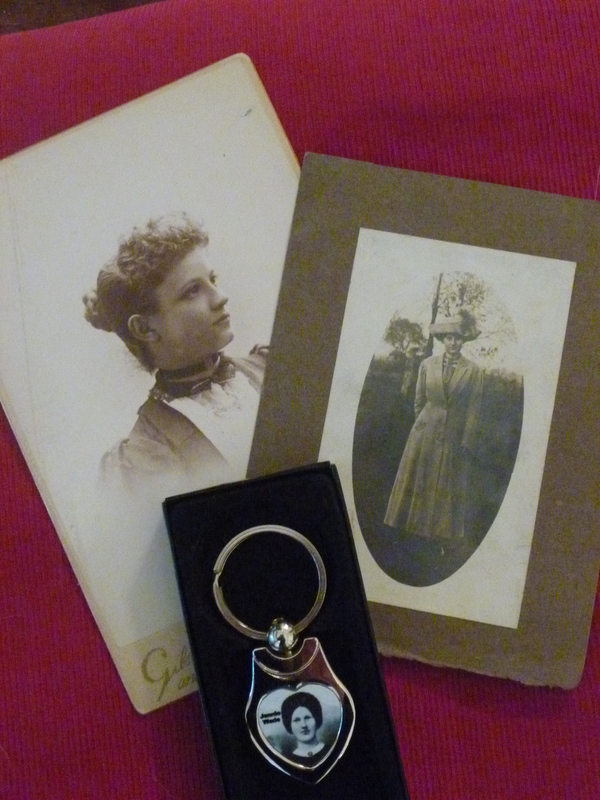 The second picture looks to be of a young woman. On the back is scrawled the name Mrs. Nora Hamilton. She looks sooo young. How can she already be married? The photo was taken by Gibson and Robbins studio in Ypsilanti, Michigan. What was going on in her life that day when the photo was taken? She probably had no children, or they would have been in the picture with her. Where is her husband? Maybe he is away at war, or died on the Titanic, or of the Spanish influenza. She is too beautiful to be me. I have no idea when either picture was taken. I seem to be starting a new collection of old pictures. I don’t know what I will do with these pictures, but I like looking at them. I am sure parts of their lives were very different than mine. No cell phones, no dishwashers, no television. Maybe no cars. But disagreeing with their husbands, trying to balance the responsibilities of a household, feeling passionately happy and deeply depressed–these must be all things that we do have in common. Right above the bin of vintage pictures, was a little watercolor that caught my eye. I didn’t need it, but it spoke to me. It featured a cat, and I don’t even like cats. 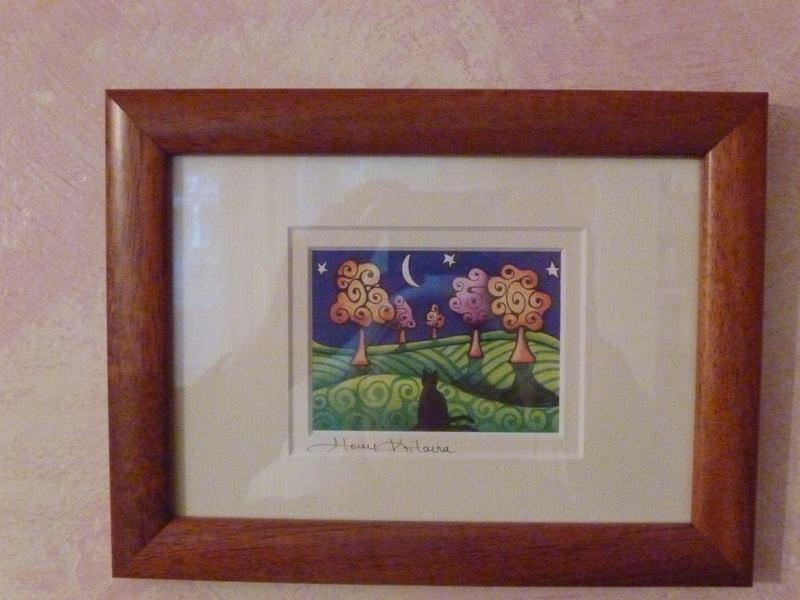 I peeked at the back of the frame, where there was a mini biography of the artist. The artist lives and paints in Hawaii. It seemed like some sort of sign. I really like the trees. And the grass. The quilt I started years ago has a similar curly cue pattern. Maybe I can retire there someday. Posted in UnProfessional Photography & Artwork, What I Learned This Week and tagged Art, classic, Hawaii, Holly Kitaura, Jennie Wade, painting, photography, vintage, whimsical, women. Bookmark the permalink. I DID think it was a sign. And you are the only one who can truly appreciate it because you were one of only two people who saw the real estate listing BEFORE the painting.